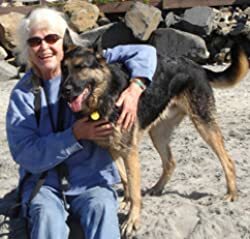 Ann Elwood lives in Cardiff-by-the-Sea, California, with six cats, a desert tortoise, seven box turtles, and a German shepherd, Louis, who looks something like Rin Tin Tin in his soulfulness. At night she can hear the ocean when the tides are high. A desire to delve more deeply into ideas finally drove her to graduate school in 1981. Her dissertation focused on an order of 17th and 18th century French nuns so she had to spend a happy year in France doing research. During that year, while not in the archives, she drank local wine with fellow historians and traveled the country with Puppy, who had far less trouble than she did communicating with the French. Now, she teaches history part-time at California State University, San Marcos, spends time with Louis and the other animals, and writes the books she has always wanted to write but never had the time for. Please enter your email address and click the Follow button to follow Ann Elwood! The Nun, the Priest, and the Tortoise is the second of three novellas, Extraordinary Loves. The story of a seventeenth-century French nun, who grew up in a peasant village, and the priest who is her spiritual adviser, it ranges deep into their discussions about about nature, where God resides, and what supersedes religious doctrine.